20 page fully illustrated and detailed building guide. Interactive pdf file lets you pan, zoom in , and rotate to see all the framing details. These barn style shed plans are downloadable now for only $6.95 with the add to cart button at the bottom of this page. As soon as you purchase through paypal you will be emailed a confirmation of your purchase with a link included that will enable you to immediately download your plans. Please make sure that your email program is able to receive emails from shedking.net, paypal, and e-junkie.com. If for some reason you don't get the email confirmation after purchasing, please check your junk email or spam folder as sometimes your email program will treat the return email from us as spam. 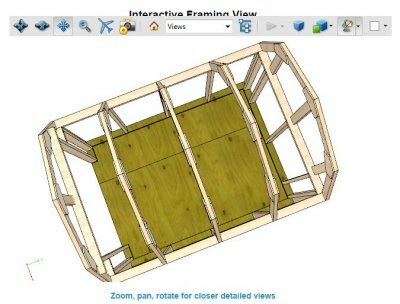 Another great addition to this plan is the 3d interactive pdf file included at the end of these plans. This file will let you rotate all around the full framing view of this gambrel storage shed and then you can zoom in, pan or rotate to get a better view of any of the detailed framing aspects of this small barn. These storage shed plans can help you build a shed for use as a chicken coop, garden shed, or tool shed. Or for whatever purpose you might need. The storage shed plans are simple and easy to understand and if you have any questions about the plans or how to build this small barn all you have to do is fire off an email to me (address included in the plans)and I will get an answer to you at the earliest possible time I can. Here's a youtube video showing the construction steps of this 6x8 gambrel roof shed. 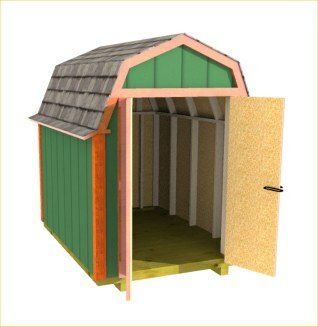 These 6'x8' Gambrel Roof Shed Plans are Just $6.95. By clicking on the 'Buy Now' button below you will be taken to a paypal window to purchase these plans. After purchase is made you should immediately receive a link to download the plans. If you should encounter any problems or just have a questions about the purchase please contact me.